A lawnmower injury can be caused by a defective product or by user negligence. 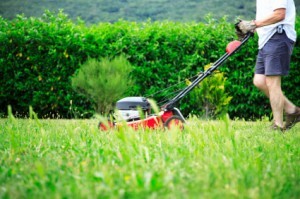 Lawn Mower Injury: negligence or defect? With spring in Arkansas and Oklahoma comes spring cleaning, both indoors and out. Getting yards cleaned up and mowed is one of the first priorities for many families this time of year. But lawn mowers and other yard tools and equipment can be dangerous for both users and those who just happen to be nearby. If you are injured by someone who is mowing, your injury and other damages may be covered by that person’s homeowner’s insurance. For instance, let’s say you are pulling weeds in your front yard and your next door neighbor is mowing her lawn. Your neighbor runs over a pile of pebbles which are hurled at you, striking you in the eye. It’s very likely that your injury could be severe enough that you need to go to the emergency room, especially if the accident happens on the weekend when your primary care physician’s office is not open. Another example also involves being in the wrong place at the wrong time; again no fault of your own. Suppose you were driving through the neighborhood where someone is mowing, when their lawnmower flings part of a tree limb at your vehicle, causing you to swerve and wreck your car. Even if you were driving at a slower speed, you might receive painful and long-term injuries from the accident. Also, if you borrow your neighbor’s lawn mower for your own use and the mower loses a blade, injuring you or a family member, you may have the right to make a claim against the mower’s owner for your lawnmower injury. These types of lawnmower injuries were caused by the actions of another person and happened to you through no fault of your own. It is possible medical expenses might be covered by the mower’s homeowner insurance policy. Additionally, you may be entitled to compensation for future medical bills, lost wages if you were off work due to the injury, and pain and suffering. A personal injury attorney is the best person to help you determine if your situation requires legal action. If your lawnmower or other equipment explodes, catches fire or loses parts unexpectedly, it could be a defective product. Another potential problem with lawn mowers, edge trimmers and other dangerous outdoor tools is when they were manufactured in an unsafe manner. For example, lawn mowers are required to have a safety device on their handle which disengages the cutting blade if the switch is not properly operated. If this switch was installed in a dangerous manner, the lawn mower could be much more dangerous than normal and injuries could result. If the lawn mower catches fire or blows up, it is possible the mower could be defective. A cutting blade that suddenly flies off of the mower could be another example of a defective product. Dangerously designed lawn mowers and other similar products may fall under the category of defective products and product liability. This area of law deals with the legal responsibility of manufacturers, sellers and others who are responsible for creating a safe product, and they must warn consumers of any hazards that might exist with their products. If a product does not meet the safety guidelines required by our government, then the companies or people associated with the dangerous product may be held legally responsible. Also, the defendant in a product liability case is not necessarily one person or company. The legally responsible party may be a designer/developer, manufacturer, supplier, distributor, marketer/advertiser, seller or repairer. There are many different scenarios of injuries and liabilities, and an experienced personal injury attorney is the best person to help your decide whether you need legal representation. If you have suffered a lawnmower injury, you need to talk with an attorney. Email us or call 1-877-392-4878 to speak with a lawyer who can help you determine what legal action you need to take. There is no cost to you for our initial phone call. Additionally, since we work on a contingency fee basis, you pay for our services only if we settle or win your case.